See the change log for latest changes only available on github. Coming soon: Cadabra in the cloud, from your browser. Email cloud@cadabra.science if you want to be a beta tester. There is now an experimental Jupyter kernel for Cadabra. For the time being you will have to build this from source, but hopefully there will soon be a way to run this on a cloud service. See build instructions for more details. Cadabra can now be used on-line (without installing it on your own computer) through the CoCalc service. CoCalc is the successor to SageMathCloud, and allows you to run a large variety of mathematics software in the cloud. To use Cadabra there, create a 'X11 desktop' session and then run cadabra2-gtk. Release of 2.2.4 (changes). Loads of new features, available on Linux, macOS and Windows. Cadabra is a symbolic computer algebra system (CAS) designed specifically for the solution of problems encountered in field theory. It has extensive functionality for tensor computer algebra, tensor polynomial simplification including multi-term symmetries, fermions and anti-commuting variables, Clifford algebras and Fierz transformations, component computations, implicit coordinate dependence, multiple index types and many more. The input format is a subset of TeX. Both a command-line and a graphical interface are available. Powerful tensor simplification algorithms, not just for mono-term symmetries but also for multi-terms symmetries like the Bianchi identity, or dimensionally-dependent symmetries like the Schouten identity. Allows for both abstract and component computations. A standalone graphical notebook interface which can also be used as a front-end for SymPy. Input and output using a subset of LaTeX notation. Cadabra is built around the fact that many computations do not have one single and unique path between the starting point and the end result. When we do computations on paper, we often take bits of an expression apart, do some manipulations on them, stick them back into the main expression, and so on. Often, the manipulations that we do are far from uniquely determined by the problem, and often there is no way even in principle for a computer to figure out what is 'the best' thing to do. What we need the computer to do, in such a case, is to be good at performing simple but tedious steps, without enforcing on the user how to do a particular computation. In other words, we want the computer algebra system to be a scratchpad, leaving us in control of which steps to take, not forcing us to return to a 'canonical' expression at every stage. Most existing computer algebra systems allow for this kind of work flow only by requiring to stick clumsy 'inert' or 'hold' arguments onto expressions, by default always 'simplifying' every input to some form they think is best. Cadabra starts from the other end of the spectrum, and as a general rule keeps your expression untouched, unless you explicitly ask for something to be done to it. Another key issue in the design of symbolic computer algebra systems has always been whether or not there should be a distinction between the 'data language' (the language used to write down mathematical expressions), the 'manipulation language' (the language used to write down what you want to do with those expressions) and the 'implementation language' (the language used to implement algorithms which act on mathematical expressions). Many computer algebra systems take the approach in which these languages are the same (Axiom, Reduce, Sympy) or mostly the same apart from a small core which uses a different implementation language (Mathematica, Maple). The Cadabra project is rooted in the idea that for many applications, it is better to keep a clean distinction between these three languages. 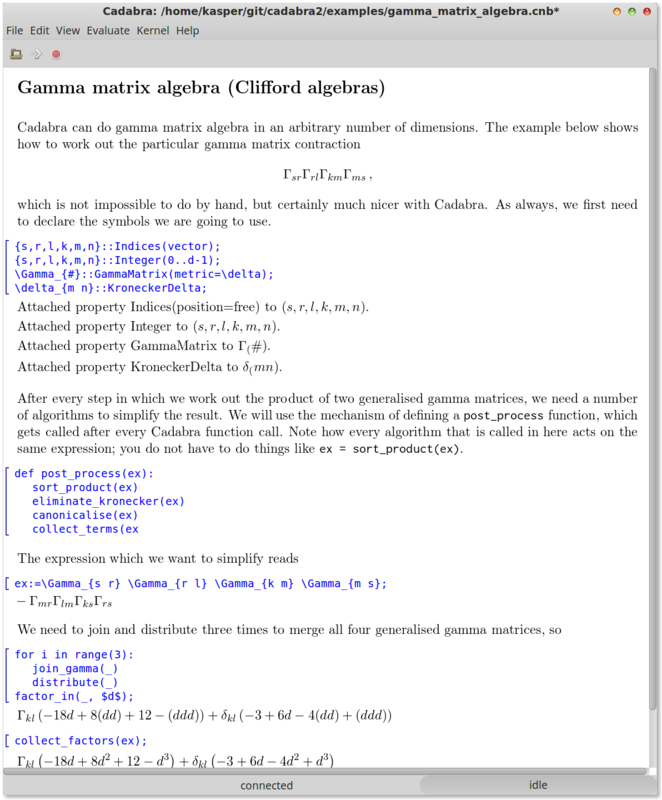 Cadabra writes mathematics using LaTeX, is programmable in Python, and is under the hood largely written in C++. Cadabra was originally written around 2001 to solve a number of problems related to higher-derivative supergravity. It was then expanded and polished, and first saw its public release in 2007. During the years that followed, it became clear that several design decisions were not ideal, such as the use of a custom programming language and the lack of functionality for component computations. Over the course of 2015-2016 a large rewrite took place, which resulted in Cadabra 2.x. This new version is programmable in Python and does both abstract and component computations. This new web site, with new tutorials and all manual pages accessible online, will also hopefully help to make Cadabra easier to use. Since 2018 Cadabra is available on all major platforms (Linux, MacOS, Windows, BSD). Visit the Q&A forum for help using it.